Drive three miles east of Luther on U.S. 66, and you will arrive at a quiet intersection where old Route 66 and Pottawatomi Road meet at right angles. The historic Threatt Filling Station, an early gas station that catered to African American travelers along Route 66, is difficult to miss. It’s the only building there. Built around 1915 using local sandstone, the “house type” station has Bungalow/Craftsman features typical of the period. Each of its four gables has wide eaves and triangular braces. The prominent front-facing gable is positioned over wide double-entry doors. That entry used to have spring-loaded screen doors, the kind that banged, bounced, and banged again when people came and went. The original 1915 gasoline pumps had glass containers on top so the attendant could measure how much gas went into the car. In their place now are two 1940s enamel pumps complete with the old geared system to indicate the flow of gas with clicking metal numbers. The signage that used to top the pole between the pumps is gone, but the old lights that once illuminated the front of the station are still in place. Except for a 1961 addition to the rear of the property, the station’s form is virtually unchanged from the way it looked when Allen Threatt built it. The Threatt family homesteaded in the Luther area, a part of modern-day Oklahoma that was opened to United States settlement in 1889, after the Federal system of American Indian reservations and land allotments had been established. Like many African Americans at the time, the Threatts saw Oklahoma land as a great opportunity. They joined former slaves of local Cherokee, Choctaw, Chickasaw, Creek, and Seminole owners, as well as former slaves from the southeast, in seeking greater security, economic opportunity, and racial solidarity in Oklahoma. The Threatt family raised crops on their farm, sold sandstone from their quarry, and, ultimately, opened and ran the filling station. The filling station benefited from its proximity to Route 66. State Highway 7 formed the northern border of the Threatt farm, and as traffic on the road increased during the early decades of the 20th-century, Route 66’s local alignment incorporated Highway 7. Allen Threatt made a sensible business decision to take advantage of the farm’s location and open the filling station. From the mid 1910s through the 1950s, the Threatt Filling Station was a popular roadside stop for locals and travelers alike. The station was one of a very few places on Route 66 where people of color were welcome during an age when African American children setting out on trips asked their parents why they needed to carry so much food and water, as well as toilet paper and empty jars. Black adults growing up along Route 66 in Chicago just “knew which stretches they weren’t allowed to use.” The National Park Service listed the Threatt Filling Station on the National Register of Historic Places in 1995. 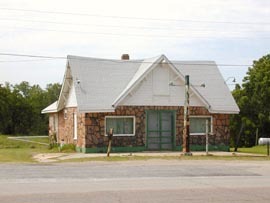 The Threatt Filling Station is at the intersection of Historic Route 66 and North Pottawatomi Rd. in Luther, OK. It is closed to the public and may be viewed from the road. The Threatt Filling Station National Register nomination form can be found here.